Fabulous gift baskets with books! Cancellations: Please call our toll-free number to speak to a customer service representative to determine if your order can be cancelled. Once an order has been shipped it can not be cancelled. Returns/Refunds: If an order is returned to us due to an incorrect address, patient discharge from hospital or refusal of order by recipient we can refund the cost of your gift, but not the cost of shipping. If you choose to reship your gift an additional shipping charge will apply. 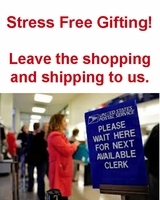 Refunds due to shipping damage: If your gift arrives damaged the shipping box and materials must be held until the shipping carrier has the opportunity to inspect the damages. Once we receive word from the shipping carrier regarding the damages a replacement gift or refund can be given. Returns/Refunds: If you are not satisified with your gift you can return your gift to us for a complete refund. In order to receive a full refund the gift must be returned. To return the gift call our toll-free number and we will arrange for UPS to pick up the gift at your location. Refunds are issued when the return is received and verified.